← I Can Hardly Wait! These are so easy to make and dangerously tasty! 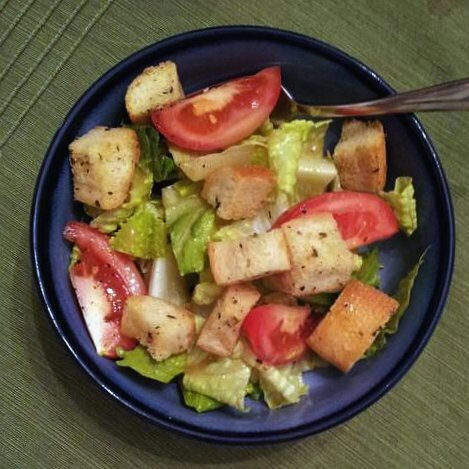 “Yes, I would like some salad with my croutons” kind of good. I hogged them all tonight, but my husband told me I could have his share – that is real love in action, people! 😉 I need to make more of these ASAP, who knew that it was these croutons that my salads had been missing all along? Thanks for reading, enjoy! Preheat the oven to 300 degrees. Place the bread cubes in a medium mixing bowl. Stir in the melted butter and olive oil and toss to coat. Season to taste with garlic powder, dried parsley, salt and pepper. Toss once more until everything is evenly combined. Spread the croutons in a single layer on a rimmed baking sheet. 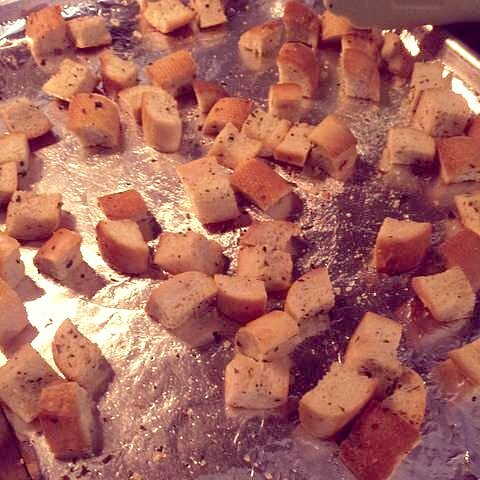 Bake, stirring once every 10 minutes, until the croutons are light golden and crisp and no chewiness remains. They will bake about 40 – 50 minutes total but the time may vary depending on the size of cubes and type of bread. Remove to a cooling rack and let cool completely. Store in airtight container.